New Brickweb Marketing Pack - Get Yours Now! Repre­sen­ta­tives from Brickweb have been out and about this week delivering our brand-new marketing packs. We are currently visiting companies in our home town of Blackburn as well as the surrounding industrial areas of Burnley, Shadsworth and Altham though our pack is available worldwide upon request. Our pack opens with a welcome letter, detailing the many aspects of web development that our expert team can provide. From social media campaigns and targeted newsletters to our custom-built control centre and bespoke design, our opening letter contains detailed information on the world-class service we provide and how it can revolutionise your business. A brief introduction to our various design, technical, admi­nis­trative and managerial teams is included as part of our commitment to providing a truly personal service. A great number of online shoppers now use a smartphone or tablet to access the internet, review and compare products, find out company information and much more before making a purchase. Brickweb provide only responsive websites, meaning that each site automatically displays at the best resolution for the device it is accessed from. Customers now expect this facility as standard; non-responsive websites that require a lot of scrolling, panning and zooming are quickly falling out of favour. The Brickweb pack contains our newly-designed flyer which details our superior understanding of mobile websites while also displaying our expert design skills. At the heart of our new marketing pack is a CD which contains examples of a diverse selection of our work. Here you will be able to experience for yourself the elegance, efficiency and superlative usability that has made and cemented the enviable Brickweb reputation. 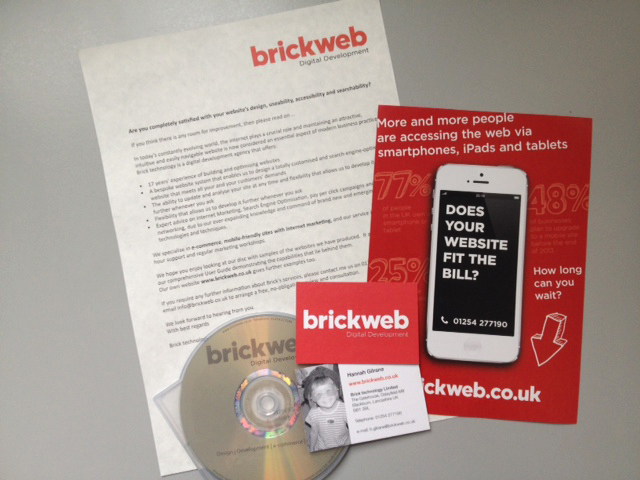 If you would like to receive one of our new marketing packs, please contact a member of our team personally on +44 (0)1254 277190 or you can email us at info@brickweb.co.uk. Brickweb - Your partner for Internet Marketing.